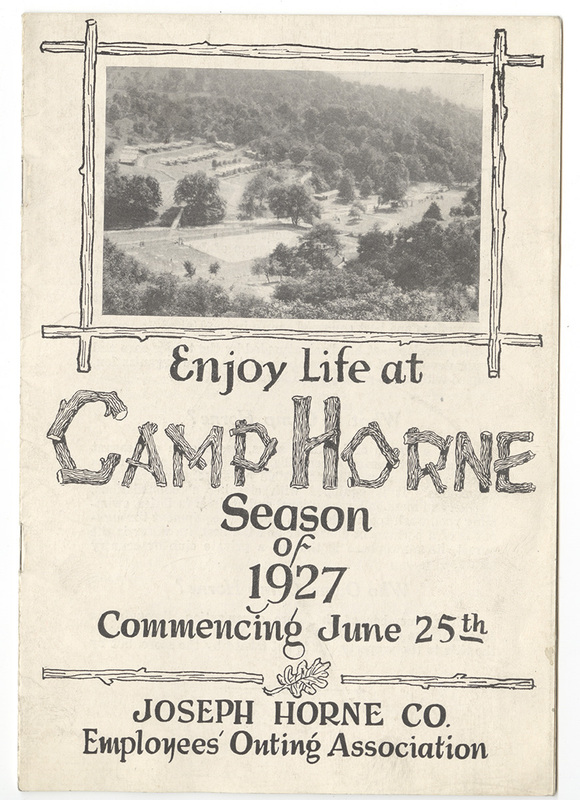 Brochure, “Enjoy Life at Camp Horne,” 1927. George F. Wazenegger Collection, MSS 770, Detre Library & Archives at the History Center. 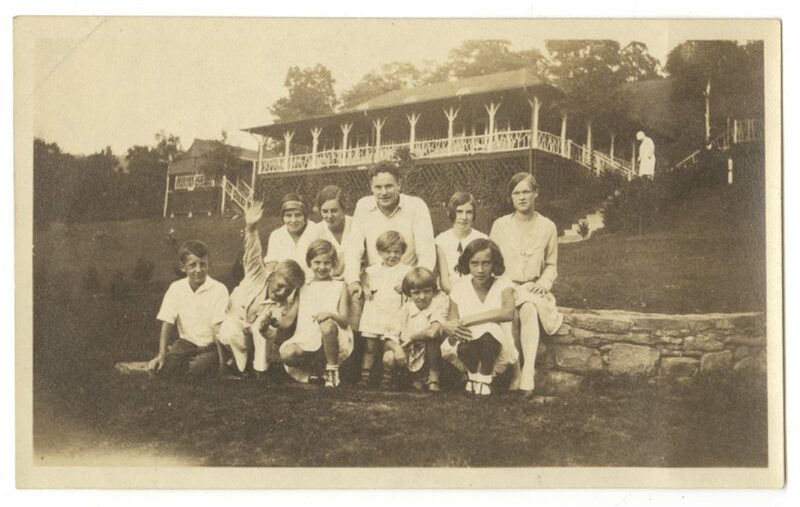 Camp Horne was the dream of Albert H. Burchfield, a manager at the Joseph Horne department store and son of one of its founders. In 1907, he and fellow employees began raising funds to set up a summer camp where “juniors” – teenagers who worked as errand boys and package wrappers – could spend a week away from the smoky city camping in the outdoors completely free of charge. After three years of fundraising, Camp Horne opened in the summer of 1910. Each week, the company bus brought 20 or so juniors (boys one week, girls the next) from the store directly to the camp up the Ohio River two miles north of Emsworth, Pa. They slept in tents, played baseball, swam, hiked in the woods, and in the evenings danced in the pavilion or enjoyed entertainment by the adult employees of Hornes. The food was plentiful and delicious, and many left heavier and healthier than they arrived. Within a few years, the camp could accommodate 60 people. Though originally intended as a special place for the youngest employees, Camp Horne proved so attractive that everyone wanted to visit. Over the years, additional land was secured and amenities were added. By the 1920s, anyone who worked at Hornes could register to stay at the camp for a small fee (juniors were still free). The company even ran a bus during the summer so employees could travel directly from the store, stay at the camp overnight, and return to work in the morning. Soon, employees could invite guests as well. 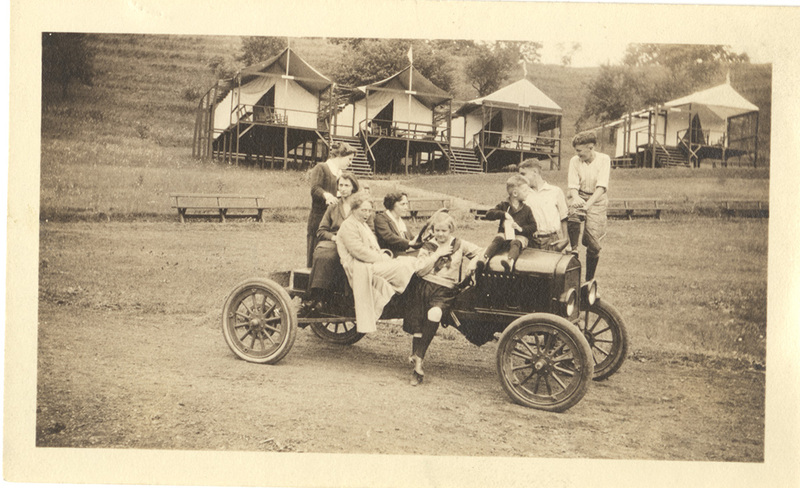 Kids and adults pile on a vintage car in front of a row of tents on platforms, c. 1920. General Photograph Collection, Detre Library & Archives at the History Center. The campgrounds featured large canvas tents on wood platforms with metal beds and wardrobes for clothes. A fully-equipped kitchen and staff kept the food flowing to the adjacent dining pavilion, which could seat 150 people. (Originally, dining tables in one long row sat 60 juniors and adults al fresco.) For the 1919 season, tennis courts, a running track, basketball courts, and volleyball courts were added. A recreation tent housed evening amateur entertainment and Saturday night dances. By the mid-1920s, the camp had become a small village with its own streets. 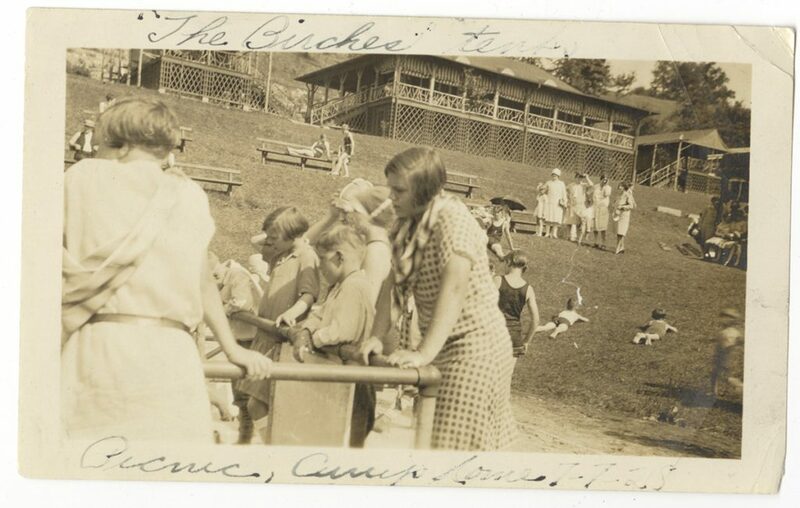 Camp Horne’s use diminished with the Depression, but it remained the venue for the store’s annual picnic through the 1940s. In fact, it became so well known in the area that the name of the road in front of it was changed from Lowries Run to Camp Horne Road. Both the camp and the department store are now gone, but the setting lives on as Avonworth Community Park. Children and adults gather to play and sunbathe in the large, central open area of Camp Horne, 1928. Camp Horne and Horne’s Building Photographs, 1996.0077, Detre Library & Archives at the History Center. A group poses for a portrait in the center of Camp Horne, 1927. The large dining pavilion and attached kitchen provide the backdrop. Horne’s and Camp Horne Miscellaneous Materials, 1996.0288, Detre Library & Archives at the History Center. Lauren Uhl is the museum project manager & curator of food & fitness at the Heinz History Center. Thank you for the great information. I have wondered about the origin of Camp Horne Rd. and the connection with The Joseph Horne Co. of which I shopped at for many years and to this day miss. I also now know the Avondale Community Park to be the original site of Camp Horne. Again, thanks!